I thank Monsignor Héctor Miguel for his words of welcome in the name of the whole pilgrim people of God in these lands. 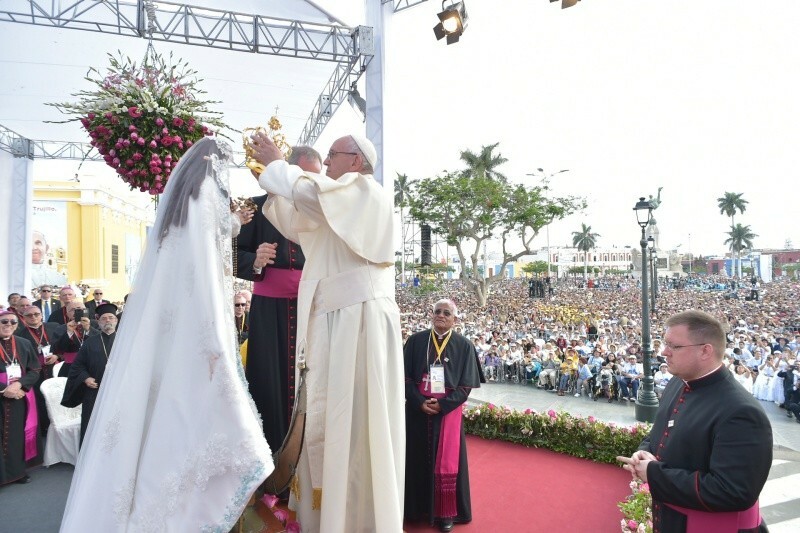 In this beautiful and historical square of Trujillo, that awakened dreams of freedom for all Peruvians, we are gathered today to meet our “Dear Mother of Otuzco”. I know that many of you have travelled a great distance to be present today, gathered beneath our Mother’s gaze. This square has thus become an open-air shrine where all of us want to let our Mother look upon us with her maternal and tender gaze. She is a mother who knows the heart of her Peruvian children from the north and from so many other places; she has seen your tears, your laughter, your desires. In this square we want to cherish the memory of a people that knows that Mary is a Mother who does not abandon her children. This “home” is decorated in a particularly festive way. We are surrounded by images from throughout this region. Together with the beloved Immaculate Virgin of the Gate of Otuzco, I greet and welcome the Most Holy Cross of Chalpón from Chiclayo, the Captive Lord from Ayabaca, Our Lady of Mercies from Paita, the Child Jesus of the Miracle from Eten, the Mother of Sorrows from Cajamarca, Our Lady of the Assumption from Cutervo, the Immaculate Conception of Chota, Our Lady of Alta Gracia from Huamachuco, Saint Turibius of Mogrovejo from Tayabamba (Huamachuco), Our Lady of the Assumption from Chachapoyas, Our Lady of the Assumption of Usquil, Our Lady of Succour from Huanchoco, and the relics of the Conventual Martyrs of Chimbote. Every community, each tiny corner of this land, is accompanied by the face of a saint, and by love for Jesus Christ and for his Mother. If we consider that wherever there is a community, wherever there is life and hearts longing to find reasons to hope, to sing and to dance, to long for a decent life... there is the Lord, there we find his Mother, and there too the example of all those saints who help us to remain joyful in hope. With you, I give thanks for the attentiveness of our God. He looks for the best way to draw near to each person, so that he or she can receive him. That is the origin of his many and varied invocations and titles. Those titles express the desire of our God to be close to each heart, so that the language of God’s love is always spoken in dialect; there is no other way of doing it, and what is more, it inspires hope to see how the Mother takes on the features of her children, their way of dressing and their dialect, in order to make them share in her blessing. Mary will always be a mestiza Mother, because in her heart all races find a place, for love seeks out every possible way to love and to be loved. All these images remind us of the tender love with which God wants to be close to every village and every family, to you and me, to everyone. I know of the love that you have for the Immaculate Virgin of the Gate of Otuzco. Today, together with you, I wish to declare her: Our Lady of the Gate, “Mother of Mercy and Hope”. Our Lady, who in centuries past showed her love for the children of this land when, placed above a gateway, she defended and protected them from the threats that afflicted them, awakening the love of all Peruvians even to our own day. Mary continues to defend us and point out the gate that opens for us the way to authentic life, to the Life that does not pass away. She walks beside every one of her children, in order to lead them home. She accompanies us all the way to the Gate that gives Life, for Jesus does not want anyone to remain outside, in the cold. In this way, she accompanies “the yearning of so many people to turn back to the house of the Father, who awaits their return”, yet so often do not know how to do so. As Saint Bernard said: “You who feel far away from terra firma, dragged down by the waves of this world, in the midst of storms and tempests: look to the Star and call upon Mary”. She shows us the way home. She brings us to Jesus, who is the Gate of Mercy. In 2015, we had the joy of celebrating the Jubilee of Mercy. In the course of that year, I invited all the faithful to pass through the Door of Mercy, “through which anyone who enters will experience the love of God who consoles, pardons, and instils hope”. I would like to repeat with you now that same hope: “How much I desire that the years to come will be steeped in mercy, so that we can go out to every man and woman, bringing the goodness and tenderness of God!” How much I desire that this land, which clings to the Mother of Mercy and Hope, can abound in God’s goodness and tender love and bring it everywhere. For there is no better medicine, dear brothers and sisters, to cure many wounds than a heart that has known mercy, than a heart that is compassionate before sorrow and misfortune. A heart compassionate before people’s mistakes and their desire to change, without knowing where to start. Compassion is active, for “we have learned that God bends down to us (cf. Hos 11:4), so that we may imitate him in bending down to our brothers and sisters”, above all to those who suffer the most. And like Mary, in being attentive to those who lack the wine of gladness, as happened at the wedding feast of Cana. Looking to Mary, I do not want to conclude without asking all of us to think of the mothers and grandmothers of this nation; they are a true driving force for the life and the families of Peru. What would Peru be like, without its mothers and grandmothers! What would our lives be like without them! Our love for Mary must help us to feel appreciation and gratitude for women, for our mothers and grandmothers, who are a bastion in the life in our cities. Almost always in silence, they carry life forward. It is the silence and strength of hope. Thank you for your witness. Appreciation and gratitude. But in thinking of our mothers and grandmothers, I want to invite you to combat a scourge that affects our American continent: the numerous cases where women are killed. And the many situations of violence that are kept quiet behind so many walls. I ask you to fight against this source of suffering by calling for legislation and a culture that repudiates every form of violence. Brothers and sisters, Our Lady of the Gate, Mother of Mercy and Hope, shows us the way and points out the best defence against the evil of indifference and insensitivity. She brings us to her Son and encourages us to promote and spread a “culture of mercy based on the rediscovery of encounter with others, a culture in which no one looks at another with indifference or turns away from the suffering of our brothers and sisters”.